I dearly hope I never drew Pierrot returning Dimitr’s gun. I looked, but I have this nagging feeling he may have. Anyone remember? So, as you may have been noticing, the story is slowly coming to a close. I mapped out the remaining strips, it points to maybe mid-July, which more likely means sometime in August. And I have a question for you! I’ve begun writing the sequence of Dimitri handling the Galactic Secret Society, and so, are there any plot threads you feel need tying up? Any niggly bit which could use a cap to clean up? If so, let me know in the comments here. I may already have thoughts on how I’m going to wrap up you particular concern, but if not, this is my chance to toss it in! Had a good week. 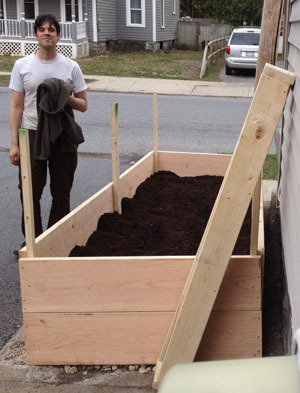 Built a raised bed and filled it, bag-by-bag, with varying types of soil. Tiring dirty work, but satisfying. Oh, and I finally finished and updated one-of-the-two strips I didn’t finish last May. You can see it here. Oh, and for those who missed it, I did eventually update the Uranus-should-have-been-Neptune strip. Lastly, there’s a fundraiser for a book, Neverland’s Library Fantasy Anthology on the theme of “rediscovery.” Looks damn interesting! Oh, and lastly last, thank you to Xaviar Xerexes for the shout out over on Alterntainment! Technically, automatics don’t go “click-click-click”. That would be a revolver. Makarovs are SEMI-automatic. Does that make a difference? What does it do when you pull the trigger and there’s no bullets in it? It’s doesn’t go “click”? Depends on the specific design; Some semi’s lock the action open after the last shot. Those that don’t will go click ONCE when empty, unless it’s a DAO (Double Action Only). Don’t worry, I just checked my Makarov and it’s double action trigger still goes snap snap snap(with a touch of springy twang) when its empty. Chris, get someone to take you shooting. You’ll have a blast and learn something about guns. 🙂 I’d take you myself, but you’re nowhere near me. The Makarov is Double-Action/Single-Action, which means yes, it will pull the hammer back when you squeeze the trigger after emptying the magazine. Plot threads that need tying? How about how Dimitri manages to stay relatively STD free considering how many aliens he’s boned. He’s better off boning aliens. Their STDs probably wouldn’t infect humans to begin with. Anyway, this society has pretty advanced medicine (see today’s episode). No, the odd part of it is how these beings even find each other attractive. But, I’m suspending disbelief on that, for the lulz. Only 7 rounds? Standard capacity for that pistol is 8, 9 if you carry with one in the chamber. Did someone fire the gun in a previous strip? From the color, must be the Parkerized version. Since the grip is also grey, most likely has Pearce PG-MAK8. If Dmitri didn’t bring any more ammo than what was in the magazine, and more than two shots were fired already, then just say it’s the 10 or 12 round version. Ohyeah, if it’s the 10 or 12 round model, then the PG-MAK8 grip won’t fit. Has to be wider/longer. Dunno if there’s a Pearce grey rubber grip for those. Only thing that pops into my mind is the ultimate fate of the LARPers voyage but I think they all died, and I just forget things. Oh, how about an SS Myra cross-over/encounter? Man you guys are geeking hard on this pistol. nooooooooooooooooooooooooooooooooooooooooo But I’m glad you’re wrapping it up nicely instead of keeping it going until you’re out of ideas and just letting it fizzle out. Classy. You have a typo in the middle of the Uranus-should-have-been-Neptune strip, where Nogg asks, “What are you taking”[sic]”about?” Also, I’m surprised Nogg said walking on an ice giant would be boring. It would be impossible. It’s a big, cold ball of supercritical fluids, so unless you’re Jesus Christ, I don’t think you’d be able to do much walking. Also, sorry to add to the feeling out in the gun, but I don’t think he’d be able to hold onto the damned thing while firing it with a tentacle. He might get off one shot, but I think the kick would launch it from his grip. Finally, after all this build up, I’m going to be seriously pissed if Emily doesn’t manage to splatter that fucker all over the rocks. Eh, Qwahntoo has already been shown to be really freaking strong. I think he can handle a handgun. The secret to killing someone with an ablative hide is to hit the same spot over and over again. @Awesome, I’ve considered going to a shooting range out of curiosity. But I can’t say i have much interest in guns. @Stephen, thank you. Yeah, hard to give it up, but I planned it this length, and it feels right, that I’m beginning to parody myself. On an episode of “Heroes” and “Supernatural” in both cases an immortal was handled by chopping them up or just burying them under ground alive. Now if you could chuck Qwahntoo into a lava pool that should do it. Otherwise he will continue till you are dead. Why regeneration is such a nifty ability! Well, I’m glad the Makarov made an appearance. This page made sense until I read the title. What weapon did Qwahntoo secrete? Other than that, it’s hard to think of plot holes. This comic has been exceptionally good at being internally consistent and connecting all its elements in meaningful ways. Maybe at the end, Nogg can give Martina’s father a hat he actually likes? Why did you fill your raised bed with so many types of soil? What are you trying to accomplish? Did you think about what will happen when it rains? @Minetruly, ha! I’m guessing you’re joking, but if not, “secreted” as in “secret-ed” NOT “secrete-d.” It’s archaic, but accepted. And different soils are important for good gardening. There’s topsoil, and compost, and potting soil, etc. And did you get my email from a week ago? It does not sound like you did. Check your spam folder. A Makarov is still hard to handle [accurately] even when you have the correct phalanges. I once read a story in Creepy or Eerie magazine where a Vampire in the jungle was consumed by army ants. Technically the skeleton was still alive/undead, but there was no flesh remaining to allow movement or to regenerate. Too dead to live, too undead to die. Hell. Probably too good for Qwantoo.